Airbags were developed to provide an added measure of safety for vehicle drivers and passengers. The results have been remarkable, with airbags saving thousands of lives since they were first introduced. However, there is another side to the air bag story that surprises many people: defective air bags are responsible for many serious, debilitating injuries every year. The airbag industry has experienced many problems in the past 10 years, including numerous product recalls. Defective wiring, defective design, unexpected deployment, and improper maintenance are just a few causes of air bag accidents. Additionally, airbags can fail to deploy, exposing drivers and passengers to even greater injuries. The lawyers at The Law Offices of Frank L. Branson are familiar with how air bag accidents happen, and we understand how undetected problems often cause airbag failures. 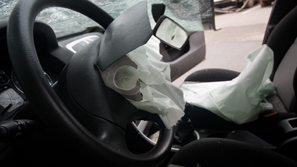 Our lawyers can represent air bag accident victims who have suffered neck and head injuries, facial fractures, spinal injuries, and other related problems. To learn more about our experience in defective airbag matters, we invite you to contact the firm here.